This is a universal triangle solutions application. To use it, click INSTRUCTIONS and select the method you desire. This application solves for missing triangle parameters if enough known parameters are given. You must provide three parameters, select the method and then calculate the remaining parameters. 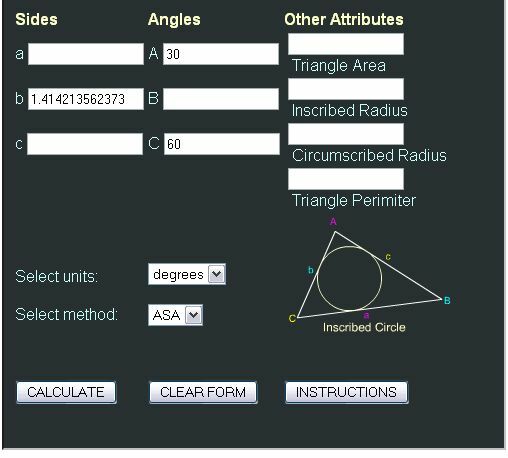 Press CALCULATE to solve for the remaining sides and/or angles. Be sure that side ‘a’ is the side opposite angle ‘A’, etc. You may select either degrees or radians.